Motor Supply Co. Bistro is one of more than 30 local restaurants participating in Restaurant Week Columbia, Thursday, October 13 through Sunday, October 23, 2016. Motor Supply will offer diners a set dinner menu Oct. 13-23, featuring items by Exectuive Chef Wes Fulmer like "Gra Moore's Pork Belly Bruschetta," made with Carolina Heritage Farms pork belly, Wadmalaw butterbeans and tomato & black pepper BBQ sauce; and "N.C. Duck Leg Confit" with Honeycrisp apple butter, Edisto piccolo farro and apple bourbon agro dolce. Head Barman Josh Streetman has prepared cocktail suggestions to pair with the dinner menu, including the "2 Brothers Martini," (named after owner Eddie Wales' and brother's beef jerky company, Two Brothers Jerky) with Tito's vodka, Beefeater 24 gin, Copper Horse Distillery Hot Tincture, olive brine and Two Brothers Jerky-infused blue cheese olives. 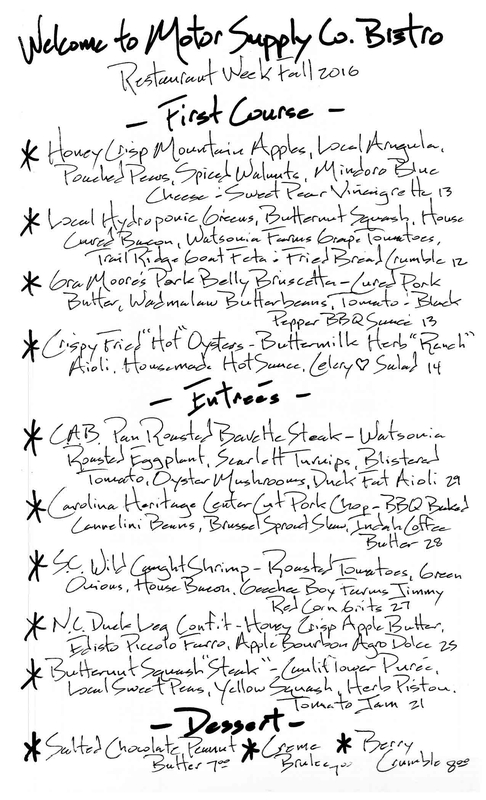 See the full menus below, and make reservations online or by calling 803-256-6687. 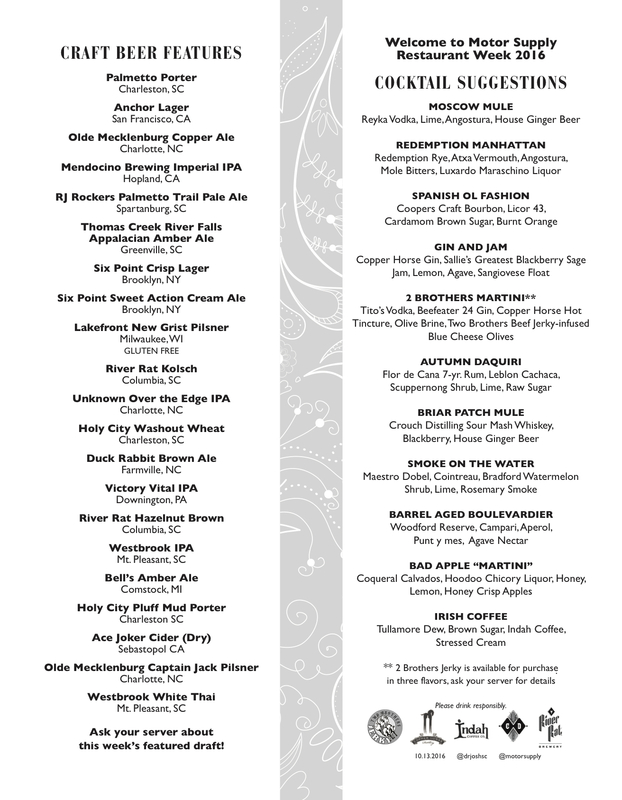 View fellow participating restaurants on Restaurant Week Columbia's website.